Written by Basanta E. P. Thapa. The Philippines’ democracy is an unfinished project. The country’s strong civil society, which is usually considered a driving force of democratisation, has become a keeper of the status quo. A close look at three local chambers of commerce and industry and how they interact with their local governments makes plain why the current system is at a deadlock. Rodrigo Duterte, the newly elected president of the Philippines, successfully ran on an anti-establishment platform against the political dynasties, which gained influence based on their land ownership during US-American colonial rule, and clung to economic and political power throughout Japanese occupation, independence, and the Marcos regime of the 1980s. Even after the People’s Power Revolution toppled Marcos in 1986, the formally democratic political structures still serve as an arena where these families vie for power. This is baffling, since the country possesses a full set of formal democratic institutions, its citizens are enthusiastic about politics, and civil society is vibrant. Conventional wisdom in political science holds that a strong civil society drives democratisation, and Philippine civil society played a key role in the 1986 revolution and saw its positions strengthened in the post-1986 political order. Nonetheless, the Philippines seem to be stuck in a clientelistic “halfway house” democracy. How is civil society supposed to contribute to rendering democracy “the only game in town”? Classically, civil society is thought to act as a “school of democracy”, where citizens gain experience with democratic decision-making. Civil society also serves as a watchdog that holds government accountable. Functioning as an intermediary between government and citizens, civil society can, on the one hand, keep certain spheres of society from direct government intervention while at the same time enact state regulations in those spheres. Lastly, civil society organisations aggregate and articulate collective interests and feed them into the political arena. Most of these functions assume a sufficient autonomy and the ability to stand up to government. Despite the key role Philippine civil society played in the 1986 revolution, observers like Howard Loewen argue that civil society in the Philippines has grown too close to government to fulfil their democracy-facilitating functions. A closer look at three Philippine local chambers of commerce and industry sheds light on the push and pull factors that lead to this outcome. Chambers of commerce and industry (CCIs) may not be obvious representatives of civil society, but they make for an instructive case in the Philippines. As the “voice of business”, with a privileged access to government due to the Local Government Code of 1991, and at least some entanglement with the political-economic elite, chambers can choose from a wider range of political strategies than grassroots organisations, for example. As traditional interest groups, the way the chambers behave within the system of interest intermediation is more relevant to the deepening of democracy than the actions of protest-oriented groups. Therefore, the rationale and political strategies of CCIs are especially telling of the nexus of civil society and democracy in the Philippines. The three chambers I present exemplify different political strategy, from highly confrontational to extremely cooperative. The three cases are typical chambers with around 100 members, all located in economically dynamic medium-sized cities in the Visayas and Northern Mindanao. Quotes are taken from interviews conducted in summer 2012. A wariness to antagonise the city’s competing political camp keeps the chamber from growing too close to the current government, evident, for example, from the chamber president’s refusal to run with the current mayor in the local elections. The possibility of political backlashes also explains why the chamber does not openly criticise the local government. The chamber president explains, “You don’t shout, you don’t do it on the radio, you don’t do it on the media”, because “If there were conflicts in the policies, the chamber people were so afraid to fight the mayors, because they can easily just close down the [business] establishment”, as the mayor observes. Chamber III exhibits the deadlock created by confrontations between chamber and city hall. This chamber is dominated by a family network rival to the one currently holding city council. Thus, the chamber’s political actions are seen in the light of family politics. “[Local government] says we are only complaining about the business climate because we are from the opposition”, as a chamber official puts it. The mayor doubts the chamber’s legitimacy: “How can you represent [businesses here] if your membership is only 100 out of 4,000?” As a result, chamber officials claim that only strategy at their disposal is public criticism: “What can we do? We go to the media. […] Where else can you go?” This, in turn, has hardened the fronts “because they criticize the mayor a lot. This is one of the reasons why the mayor is very cold as far as the chamber is concerned”, a local bureaucrat explains. Being active in the chamber has already cost many of the officials: “To be identified with the chamber was dangerous to your business. Contracts would no longer be approved, and even your business licenses would no longer be released.” The chamber’s only hope now is a change in local government, and to hit it off with the new government on a more cooperative note. Across all three cases, we see how dependent the chambers are on local government for political influence and their members’ economic well-being. The dominant strategy is to cultivate a close relationship with government without open criticism, for fear of retribution. The chambers thus achieve their political goals, but fail to fulfil most of their democracy-facilitating functions. Rather, they end up reproducing the established clientelistic system. Therefore, to consolidate the Philippines’ democracy, it is not closer cooperation between civil society and government that is needed. Rather, they need to prove “civic restraint”, keeping a professional distance both in cooperation and confrontation, to overcome the current deadlock that holds Philippine democracy from deepening. Basanta E. P. Thapa is a Doctoral Researcher at the at the University of Potsdam, Germany. This blog post is based on his article “An Ambivalent Civil Society in Democratic Consolidation – The Case of Local Chambers of Commerce and Industry in the Visayas and North Mindanao” published in ASIEN – The German Journal on Contemporary Asia. 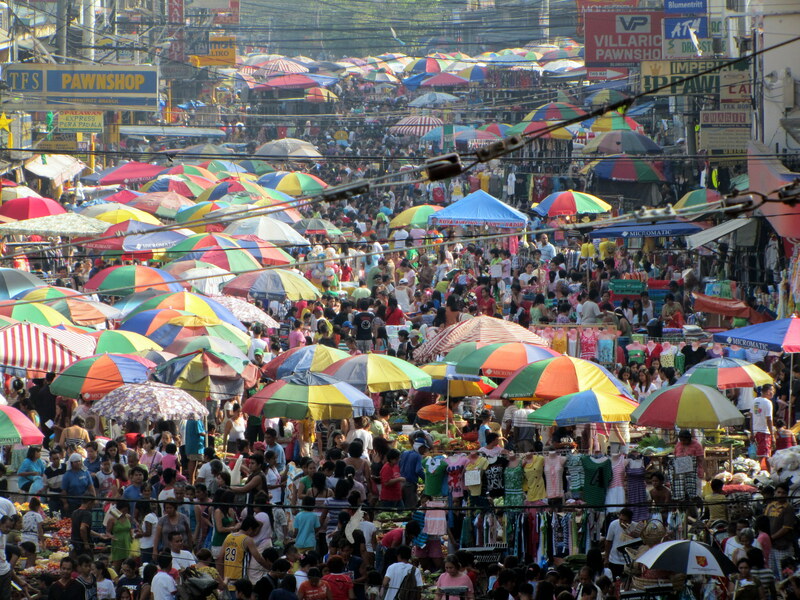 Image credit: Blumentritt Market in Manila by Thomas Moritz.